The Clinical Placement, 2nd Edition: An essential guide for nursing students is an interactive textbook designed to guide nursing students through their clinical placement journey. The first edition of this nursing reference proved extremely valuable in helping nursing students use their clinical placements as opportunities to develop the skills, knowledge, attitude and understanding that underpin quality practice. 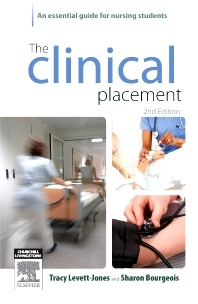 The Clinical Placement, 2nd Edition is fully revised with a fresh new appeal. It builds upon the success of the first edition, while incorporating a wealth of new, topical content written in easy-to-understand language. Designed to challenge and inspire students, The Clinical Placement, 2nd Edition: An essential guide for nursing students introduces foundational knowledge in early chapters before addressing more complex issues. This indispensable nursing resource will motivate students to think deeply and critically about important professional and clinical issues. 1.7 Who shall I turn to? 5.1 What is a nurse?